Who is someone you know that has changed for the better? How did they change? 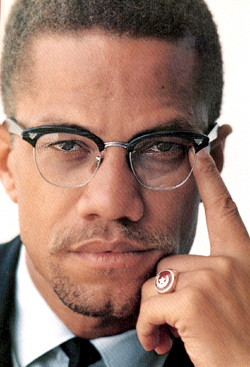 Malcolm X changed from a life of crime to a great leader. Me i use to bad in school and not go now im doin way much better and getting good grades. my mom chanch she changesmoking sigarrete in the house. My cousin us to do bad things but he change because of his family. I think that lots of people have change to be a leader. But i know that things can change. My sister has changed for the better because before she didn’t care about school. She was failing most her classes bu then she realized that she wanted to be someone. So she raised all her grades up and she now goes to college. My causin is someone i know that has changed for the better. he changed by leaving the gangs, drugs, and other bad things to getting a job that culd pay him good to get what he wanted so know it turns out to be hes a had worker. ME WHEN I USED TO HAVE BAD GRADES IN SCHOOL NOW I HAVE ONLY A’S AND B’S. I know thi9s gurl that i hang around all the time @ home and she did a lot of bad things ,she used to be bad and she incoraged me to stay in school and finish school,and never give up in school now she is an role model to me. my aunt because she stop drinking and smoking. My Buddy[[friend]] he was the one that made a drastic change,he stopped doing bad things,now he turned into a Christian and he gives me good advice. THE PERSON THAT HAVE CHANGE IS ONE OF MY FRIEND SHE USED TO FIGHT EVERDAY AND HAVE BAD GRADES AND KNOW SHES ACTING GOOD AND DONT FIGHT ANYMORE THATS A GOODTHING SHS DOING. My cousin has made a better change in his life, his parents seperated and he started feeling depressed. He started using drugs and now his taking classes and seeing a person who could help him. well the some1 that has change alot is my best friend.in Hi!Scool she use 2 be bad,but right now she have cange alot…….(^_^)………. MY HOMIE CHANGED FOR THE BETTER HE USED TO BE FROM 92 ST HOOVER.HE CHANGED FOR THE BETTER BY STOPPING. MY GRANDPA IS A MAN I KNOW THAT HAS CHANGED FOR THE BETTER. HE IS NO A COMPLETELY DIFFERENT MAN. NOW, HE PUTS HIS FAMILY FIRST BEFORE ANYTHING. I changed for the better. I change for the better because I stopped getting in trouble and getting in fights. A very important friend of mine. He used to wanted to become a gang member and become a person of negative things. I changed him around when became a very important piece of his life and stuff and changed his whole mind about what he wanted to be. He finally realized, inorder to keep me in his life, he cant continue to do the negative things he wanted to do and become. Stanly Tookie williams.He change by getting away from drugs and gang violence.He was in jail and he change his life around. MY UNCLE HE HAS CHANGED ALOT WHEN HE WAS YOUNG HE DID DRUG AND WAS GANG RELATED.NOW HE IS STILL YOUNG BUT IS IN HIS 20S HE GOES TO CHURCH HE IS ACTUALLY A GROUP MEMBER AT THE CHURCH AND HE LIVES IN NEW JERSEY. my brother is someone that change. he change from being a gangster to being a electrition. SOMEONE WHO HAS REALLY CHANGED IS ME…OVER THIS YEAR AND 07 I HAVE REALLY CHANGED IN A GOOD WAY AND A BAD WAY…I DID REALLY CHANGE AND I DIDNT LIKE IT BUT ITS COOL THINGS HAPPEN AND WHAT HAPPENS HAPPENS SO IM JUST GONNA LIVE MY LIFE! My dad changed because he used to gangbang and he also went to jail for 3 years.He changed by getting out of jail, getting a job and taking care of his family. My cousin has changed. She used to hang around the adults when she turned 15 it felt kind of boring. When she turned 16 thats when I guess she realized that this is almost the end of being a kid! I know I’m 14 and that she’s 16 but I still like to have fun and thats the way I like it to have it like the good old days. i think i have because i got older and more mature…. ONE PERSON THAT I HAVE KNOW THAT HAS CHANGED FOR THE BETTER IS MY FRIEND IN MIDDLE SCHOOL. IT WAS IN THE SEVENTH GRADE AND HE DID BAD IN ALL OF HIS CLASSES. THEN HE HAD A TALK WITH THE TEACHER AND HE STARTED TO DO GOOD. HE STARTED TO GET GOOD GRADES AND DID HIS HOMEWORK. A VERy iMP0RtANt FRiENd 0F MiNE.hE USEd t0 tAlk BACk t0 hiS M0M BUt i ChANgE hiM AR0UNd i tAlk t0 hiM ANd hE 0NE 0F My VERy iMP0RtANt FRiENd. WELL FOR STARTERS ME BECAUSE OUT OF ALL I BEEN THROUGH I’VE BEEN TRYING MY BEST TO LEARN FROM MY MISTAKES AND TRYING MY BEST TO TRY AGAIN AND WHEN I DO I TRY TO DO MY BESTSO I COULD GET ANOTHER CHANCE WITH THE THINGS I MESS UP WITH. I don’t know anyone that has changed besides myself. I’ve changed by doing all my work and getting good grades. Also by changing my attitude. my uncle he used to be a gang member he got lock up .. he spent 3 years on jail but now that he got out he change for good .now he got married he have 2 child and they live on a nice house on guatemala. My Mom Used To Be A Drug Addict Who Was In And Out Of Jail Several Times Before I Was 8 Years Old. On My 13th Birthday She Promised To Change. I Didnt Believe Her Because She Promised So Many Times Before, But Looking At Where She Is In Her Life Now, She Really Has Changed For The Better. what makes him be a great leader is when he changed. THE PERSON I KNOW THAT CHANGED FOR GOOD IS MY FRIEND BECAUSE HE USED TO GET BAD GRADES THEN HE DECIDE TO GET BETTER GRADES. I changed because I know I can make a difference in my life. WELL I HAVE AN OLDER CUZIN THAT WAS IN GANGS FOR ALOT OF YEARS AND HE WAS DOING DRUGS AND HE DROPED OUT OF SCHOOL AND WELL HE DIDNT CARE ABOUT ANYTHING BUT HE REALIZED HE WAS WRONG SO HE CHANED AND NOW HE IS A LAWYER…………..
my grandmother has changed for the better.she changed by not drinking at all.she has not drunk in about 3 years.im am so happy for her that she has changed her life. I KNOW THAT I’VE CHANGED FOR THE BETTER.I KNOW BEING LAZY IS MY THING. I think someone that has changed for the better is my best friend. MY COUSIN ENMA HAS CHANGED FOR BETTER SHE USE TO HAVE BAD GRADES AND NOW SHE ONLY HAVE A+ IN ALL HER CLASSES SHE DID A GOOD CHANGE.. I CHANGED FOR THE BETTTER CAUSE NOW I’M GETTING GOOD GRADES.NOW I DO MY WORK AND STUFF. WELL MY FREIND THAT I MET IN THE 6TH GRADE HAS IMPROVED.SHE UESED 2 DITCH,CUSS AT HER TEACHERS, AND DIDNT CARE ABOUT SCHOOL AT ALL BUT NOW SHE REALIZE SCHOOL IS VERY IMPORTANT!!!!!!!!!! Well the person that have changed by leaving the drugs and the gangs is my cousin he changed. my dad because he drink alot but now he stop because we had talk to him and he stop becuase me and my lil sister..my cousin to he was in drugs and gang but now he got out of jail and stop doing drugs and the gangs. My cousin has changed alot ..
he used to be careless about his grades and very sad. no he does better in school and is happier than before…. My friend change for the better because she was going to get jumped in a crew and she was smoking.I had talked to her and then she decided too changed and be a leader. The person who change was my grandpa he used 2 be a gang member.He change by going 2 church and he relize that he had something life to achieve it. THE PERSON WHO I THINK HAVE CHANGED ALOT IS MY BROTHER. THE WAY HE IS NOW IS A TOTAL DIFFRENT PERSON NOW HE IS A DAD AND HE TAKES CARE OF HIS DAUGHTER. A PERSON THAT CHANCE TO THE WAS MY UNCLE TAHT HAD DRINKING PROBLEM. SO HE STOP BECAUSE MY SISTERS AND I WERE BORN AND DIDNT’WANT US SEE HIM LIKE . SO HE STOP AND GOT A BETTER LIFE…..
To me, my brother changed from a drug adicter, to a normal person.I’m proud of my brother. My big brother changed to better man he is not in gangs and he is working and he is going to be a dad. ya my border he whent to jail and he have ben there for 2 years allready but he is cameing out i to week and 3 days he haved change hezz behaver !!!!!!!!! my mom has changed becouse she was the type of teen that we call a fukup but whene she had her first chiled she realized she had to change and she did. I changed by doing well in school. My cousin has changed because he now has a family and he is going to go back to school. My older sister changed alot by getting out of this bad neighborhood.What she did was go with her husband now she lives alot more happy. well my naber his name is danney! well he was a gangbanger and he would smoke a lot so on ebay he wsa high and he was driving so he was in a real bad acsident and he had brain damig so cince that day he stoped and he started to change. my uncle. he all ways used to be high and smoking. he has whent to jail many times. the last time he was locked up was about a year ago when he got out he desided to change and he has. he dont really smoke that much and he has changed. My Parents Changed My Life. And SOme Of My Friends. My Parents Have Tought Me Rigth From Wrong. I Would Have Probaly Been In A Gang. I don’t know one that change for the best or something like that. Well I know I changed for the better because I improved my grades in school and I used to have really bad grades. I KNOW SOMEONE THAT CHANGED A LOT.IN HIGH SCHOOL HE GOT INVOLED IN A ALOT OF BAD STUFF.HE WENT TO JAIL FOR ALL THE THINGS HE DID.AND RIGHT NOW HE IS GETTING A COLLEGE DEGREE. i know that my dad was a person that changed dramatically. my dad changed in the way that before he had any children he used to be a drugadict and a drunk. he didnt wanted that for himself as a person nomore becouse once he almost died of an overdose. after that he dint do much drugs or any drugs at all. however he contined to drink small amounts of alcohol, but over the years he stopped. now my dad never drinks or does anything inhealthy. Me because i used to get bad grades . MANY OF MY HOMIES HAVE CHANGED FOR GOOD BECAUSE THEY BEEN IN JAIL OR CAUSE SOMEONE CLOSE TO THEM HAS GOT KILLED!!! !SO THEY WENT BACK TO SCHOOL OR EVEN GET A JOB!!!!!! I studied by doing my homework. To review for the test I will study #31.